30 years of soil moisture imaged from satellite data | Watts Up With That? From the Vienna University of Technology, a first. A very cool video follows. Since soil moisture is an indicator of evapotranspiration, I’d love to see a closeup around Mount Kilimanjaro, whose ice cap loss is said to be more related to tree loss and loss of evapotranspiration that Al Gore’s claims of global warming. Soil moisture can be measured with satellites using microwave radiation. Unlike visible light, microwaves can penetrate clouds. Satellites can either measure the earths natural microwave radiation to calculate the local soil moisture (passive measurement) or the satellite sends out microwave pulses and measures how strongly the pulse is reflected by the surface (active measurement). Over the years, various satellites with different measurement methods have been used. “It is a great challenge to extract reliable soil moisture data from these very different datasets, spanning several decades”, says Wolfgang Wagner. To address the current lack of long-term soil moisture data the European Space Agency (ESA) has been supporting the development of a global soil moisture data record derived by merging measurements acquired by a series of European and American satellites. 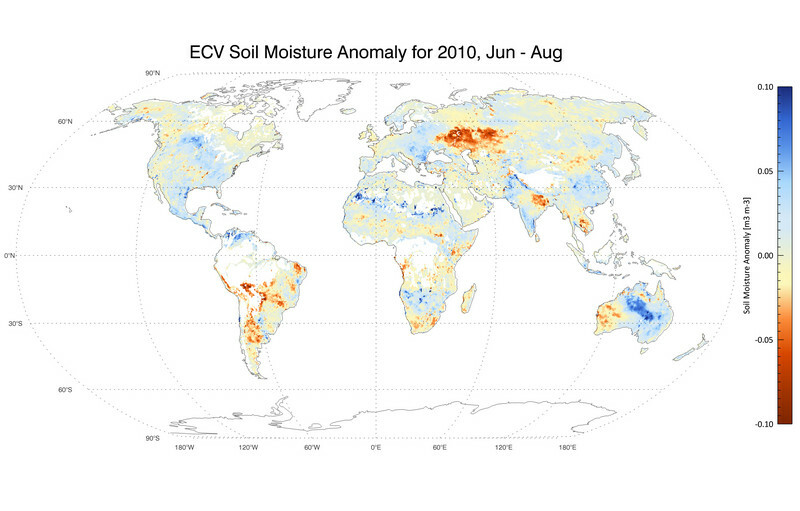 ESA is now happy to announce that the release of the first soil moisture data record spanning the period 1978 to 2010. The soil moisture data record was generated by merging two soil moisture data sets, one derived from active microwave observations and the other from passive microwave observations. 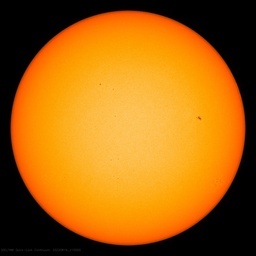 The active data set was generated by the Vienna University of Vienna (TU Wien) based on observations from the C-band scatterometers on board of ERS-1, ERS-2 and METOP-A; the passive data set was generated by the VU University Amsterdam in collaboration with NASA based on passive microwave observations. The harmonization of these datasets aimed to take advantage of both microwave techniques, but still the challenges were significant. Amongst other issues, the potential influences of mission specifications, sensor degradation, drifts in calibration, and algorithmic changes had to be accounted for as accurately as possible. Also, it had to be guaranteed that the soil moisture data retrieved from the different active and passive microwave instruments are physically consistent. As this is the first release of such a product, not all caveats and limitations of the data are yet fully understood. It will therefore require the active cooperation of the remote sensing and climate modeling communities to jointly validate the satellite and model data, and advance the science in both fields along the way. The NanTroSEIZE Project: Drilling through a plate boundary in an active subduction zone. ← The Intriguing Problem Of The Younger Dryas—What Does It Mean And What Caused It? Perhaps some ground truthing would be more useful than “active cooperation of the remote sensing and climate modeling communities”. I think it might be interesting to see averaged together the monthly averages of each year to see if there is a seasonal variation. I know there is a variation from year to year but there should also be an average monthly variation (rainy season vs dry season, etc). When your name is “Wolfgang Wagner”, paying obeisance to these communities is a must. He already was forced to resign as the Editor in Chief of the journal Remote Sensing and apologised directly to Kevin Trenberth for daring to allow an article by Roy Spencer that failed to do so (and contradicted the models) to be published. By Wagner’s own admission, the article was properly peer reviewed, and had no flaws that he could cite that should have prevented it from being published, but he resigned anyway, claiming that the modeling community should have been consulted (despite Spencer’s paper relying entirely on observational data), and then apologised to Trenberth for letting it through! Wolfgang Wagner is a shining example of the bullying and initimidation that goes on within the climate “science” community. I don’t know that his track record of caving into pressure from “the team” says anything about the quality of this particular work, but for me, anything that this guy produces will have the stink of political pressure from “the team” in general and Kevin Trenberth in particular attached to it. And a mighty stench it is. You’ll see a group of scientists looking into the theory that you should be seeing a pattern of increased drought. Naturally, with several drought indexes to choose from, they had to come up with a way to see GLOBAL coverage. So, they used a popular hydrologic simulation model to estimate soil moisture levels at the 1º latitude by 1º longitude resolution for land areas of the globe for the period 1950 to 2000. What they found was simply amazing. The problem is, some people will say, they only used the period from 1950 to 2000 and missed the dust bowl era and the recent Texas and Mexico droughts. The telling parts of their research, their time series plot for the globe and for various continents shows no upward trend whatsoever. Using their data, “…The mean number of global droughts > 500,000 km2 occurring in any month is about 4.5 (or 55 yr-1) with a standard deviation of 1.6. This time series is quite variable and indicates several periods of increased global drought activity: the mid-1950s, 1960s, late 1980s to early 1990s, and late 1990s. The mid-1970s to mid-1980s are characterized by the lowest number of droughts, apart from a short burst of activity around 1976–77. The year with most drought months is 1992..”. In other words, Sheffield et al. analyzed drought patterns at the global scale for the period 1950 to 2000, and found no evidence to support claims of increasing drought activity. Might be interesting for someone to bump their data against the satellite data. Rainfall recharge (rainfall minus runoff minus deep percolation) minus evapotranspiration calculated on a daily basis. Apparently Amazonia is immune to microwaves. That seems to be a large gap in the global moisture record. In my above post that’s rainfall recharge to the soil not the groundwater system. No, the rainforests don’t have an anomaly. They are always wet. Cool graphics. Someone could probably go through all this data in great detail and show no net change at all. But the IPCC would start in 1985 and end in 1989 showing a huge increase in drought. There is no change in precipitation anywhere on the planet over the long-term. The prediction, of course, is that rainfall will increase by about 20% at a doubling of CO2 but for some reason the pro-AGW people can only talk about the increased droughts that will occur. Such is this debate. The data starts from the peak of the PDO in 1980. So whatever trends exist may well be cyclical. The dry anomaly over Western Australia has reversed in the last year or so after heavy rains over most of the area. Darn, they left poor old Australia off the global video for ten years in the 0’s, then the last year shows a -50% moisture in the central tablelands area of NSW. Not so, every dam in the region is close to 100% and the ground is waterlogged, this year is the first in 30 years that I have had to wade around it in gumboots and water rushes/reeds are growing where they never have. So far this year my rainfall is 45% above average, and the evaporation over the summer was way below normal, which is around 12mm a day, this year the dams have overflowed 3 times. As the satellite sea level data gives a rise three times above the tidal gauges on the east coast, my faith in them is not restored. One could debunk a lot of drought nonsense from the animation — the Sahara, for instance, ‘looks’ (eye-ometer) to be getting more moisture on average over a long time period. India too, from the same perspective. But, as my farmer-granddad used to say, “Average rain doesn’t help if it hasn’t fallen on my north forty”. There. Fixed. And, needless to say, grants on the way. Golly Gee! This is like music to my eyes! I think they will be able to make a dang useful app out of this. I am just curious . . . was thirty years of data arbitrary or for some good reason? How much computer space, programming time, and mathmatical education was involved in it’s development ? How much do you reckon it cost initially? Good work . . . I truly would have loved to have a job that developed applications like this. I admire the innovation & creativity and appreciate the efforts it takes to make it look so easy to visualize! I hope ‘you’ are well compensated for the effots. What you are seeing is monthly averages (I think) the way they dance between about four different patterns makes me wish that the data was sorted by lunar declinational periods of 27.3 days so the four fold patterns of the repeating jet stream location shifts could be better visualized. I would like to see the whole map remain in view instead of the zooming around to make political statements about weather events while loosing the overall view, by doing so they might have reached a bigger audience, but lost the objective transfer of usable total view of all data available. In the same vein I would have liked to have seen both the complete loop of the actuals as well as the anomalies. (note to self) acquire the data and make the the movies you want to see, the (almost affordable) technology is available you know. Thanks for covering this story I’ll add this to my list of things to do when I win the lottery.